How can the integration of fisheries and aquaculture and other uses be evaluated? How can the main conflicts be characterised? Where does or will spatial co-use occur (mapping)? 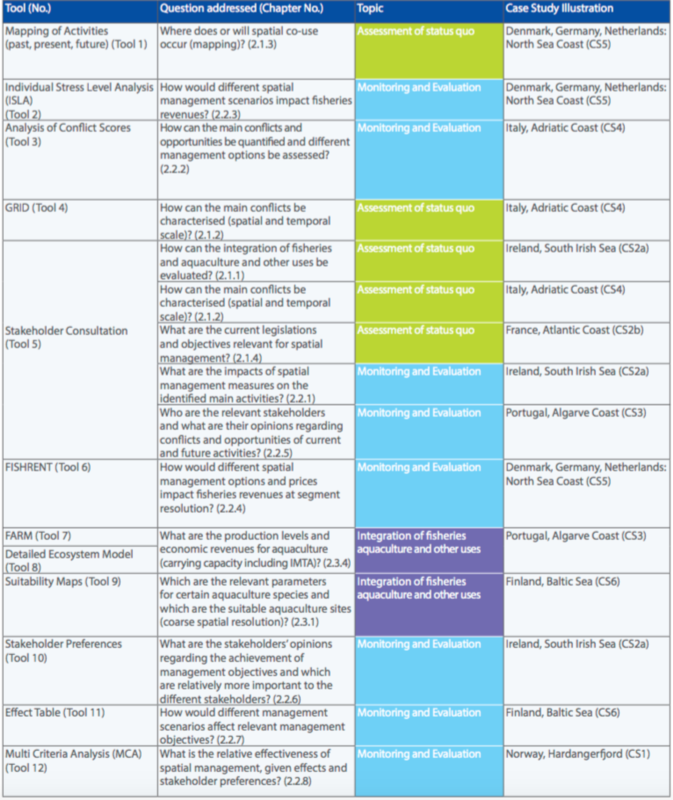 What are the current legislations and objectives relevant for spatial management? What are the impacts of spatial management measures on the identified main activities? How can the conflicts and opportunities be quantified and different management options be assessed? How would different spatial management options impact fisheries revenue? Who are the relevant stakeholders and what are their opinions regarding conflicts and opportunities of current and future activities? How would different management scenarios impact relevant management objectives? What are the relevant parameters for certain aquaculture species and what sites are suitable for aquaculture? What is the optimal aquaculture practice? What are the production levels and economic revenues for aquaculture? This guidance has been developed in the context of the COEXIST project., which ran from 2010 to 2013. It provides a comprehensive assessment of the conflicts and synergies between fisheries, aquaculture and other activities in the coastal zone in six COEXIST case study areas. The purpose of the guidance is to promote the better integration of aquaculture, fisheries and other activities in the coastal zone by the identification and application of appropriate spatial management tools. Different methods and tools have been applied and tested across the case studies in order to answer these specific questions addressing economic, ecological and social dimensions in marine spatial planning. The table below present the tools used in the COEXIST case studies to address specific management questions. By answering numerous questions related to spatial management and presenting several tools to evaluate potential or existing conflict between coastal activities, this guidance helps maritime actors and spatial planners to take spatial planning decision and resolve potential conflicts. 13 management tools are described and evaluated, thus helping actors to chose the most appropriate one. 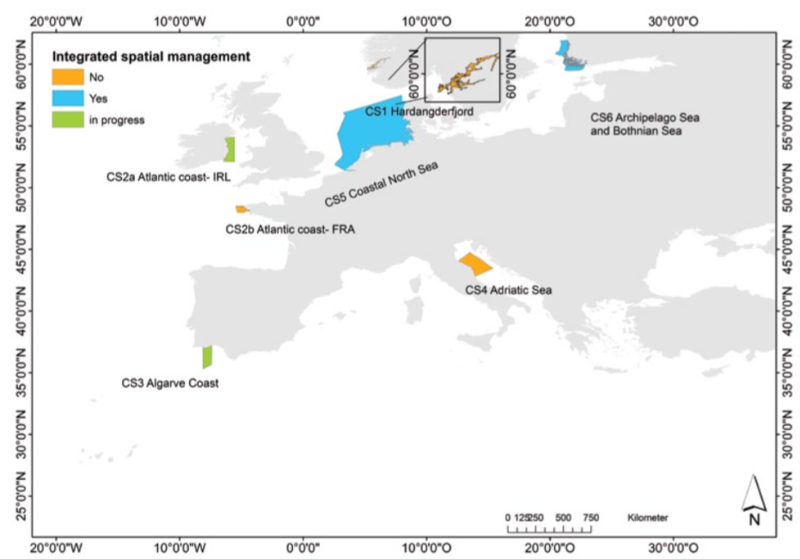 The conclusions drawn and the recommendations in the document are largely based on the experience of applying a set of methods and technical tools to address a number of key questions in spatial management in six COEXIST case studies in the Baltic Sea, the North Sea, the Adriatic Sea, the Atlantic Ocean and the Mediterranean. For each case study, the site characteristics, the coastal activities, the legal framework, the management authorities, the main conflict types and the opportunities for Co-existence between the different activities are presented. Because of the diversity of questions asked and of tools presented, the results of this guidance are highly transferable. As this guidance is based on 6 very diverse case studies, it allows a transferability of the results to numerous possible cases with very different geographical and maritime characteristics, thus very diverse type of conflicts and management options. Fisheries, and other Activities in the Coastal Zone: From tools to practical examples, Ireland: Coexist project, 2013, 79pp. printed.